Shoprite recently won public kudos by ‘zero-rating’ Ultrex sanitary pads – essentially selling the brand at cost price. This bold move is exactly what we should expect from private companies facing up to this country’s social and economic inequalities. Although South Africans may not experience the extreme poverty of people in low-income countries, the indignity of deprivation in plain view of extreme wealth makes ours a particularly brittle society. Much of the social unrest we experience boils down to whether people feel valued or not. For those coy male readers puzzled by all the excitement over ‘women’s hygiene products’, let me explain. Many teenage girls and young women cannot afford to pay for sanitary pads and thus stay away from school or work during their menstrual periods. It is a common reason for absenteeism that leads to school dropout, which perpetuates the inter-generational poverty of households. It is just one of the causes of school dropout, but should not occur in a middle-income country such as ours. No girl should be too embarrassed to go to school. Let us hope that Shoprite’s move is not just a temporary marketing ploy and that the store will continue to keep the cost of pads down – a loss leader which shows that they know and value their customers. 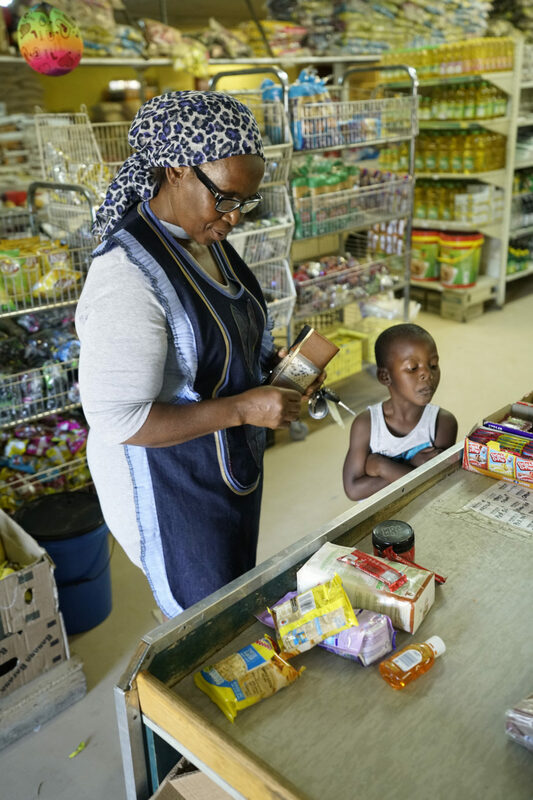 It also shows that private enterprise can come up with simple, powerful ideas to change the experience of the poorer consumers in South Africa. Here is another which warrants urgent consideration: The poorer half of the population spends most of its money on food (25%), housing (20%) and transport (20%), but is still deprived of a decent standard of living. While monthly income transfers from government protect most of these families from starvation, still a quarter of children under five are stunted (short-for-age) from chronic malnutrition. Stunting affects both physical and cognitive functioning and is estimated to knock off at least 1.5% of South Africa’s GDP each year. Eliminating such loss of physiological capital would improve child health, educational outcomes and economic productivity. It would be the most physical manifestation of the value we place on our children. A significant part of the problem of stunting is that babies are weaned too early from their mothers’ breasts onto relatively cheap calorie-dense, protein-poor porridges. If we could encourage mothers to breastfeed for longer, and then introduce nutrient-rich solids at six months of age, stunting rates could drop dramatically in South Africa. The astounding fact is that we could achieve close to zero-stunting by 2030. A food as basic as chicken eggs could contribute greatly towards this goal. Eggs contain high-quality protein, choline and many other micronutrients needed for physical and mental growth. A recent randomised controlled study from Ecuador showed a 47% reduction in the prevalence of stunting by introducing an egg a day into the diet of children aged six to nine months. While a few children may react badly to eggs, the latest science points to sensitising children earlier – rather than later – to potentially allergenic foods. For this reason, the health department now promotes the introduction of eggs at six months of age. Furthermore, despite being cholesterol-rich, normal egg consumption does not result in an increase in blood cholesterol. Unfortunately, eggs have become too expensive for many families who receive child care grants. According to the SA Poultry Association, the markup from the farm gate to store is about 60 – 65%, of which some is the cost of transport and retail sales. The rest is profit. Arguably, the biggest beneficiaries of social grants over the past twenty years have been Shoprite, Boxer, Score and other food retailers. They have positioned themselves to take full advantage of the revenues that flow from the R150 billion or so transferred to grant beneficiaries each year. They have the power to make a significant dent in the prevalence of stunting by selling a limited proportion of eggs at cost price. This could be done through discounts on the first two dozen eggs purchased at each till transaction. It would mean taking a small hit on their annual profits over the next decade but would grow demand for eggs over the long-term. Barring viral outbreaks, egg supply is highly elastic if demand grows steadily over time; and per capita consumption in South Africa is still low compared to many other countries. These are the type of bold moves we want to see from private companies in South Africa. It comes at a time when many companies are jaded by government demands for compliance with codes of good practice and may be tempted to tune out of broader engagement for societal transformation. That would be a tragedy because we still need the boldness and ingenuity of private enterprise for public innovation in South Africa. Learn more about Grow Great and their work that is driving a national commitment to a stunting-free generation by 2030.